Fifteen CDs is a big setâ€”and a bargain for $99.95. But in what sense is GDMâ€™s big holiday release a â€œComplete Editionâ€? Obviously itâ€™s not everything the Maestro has written; that couldnâ€™t be done in ten times as many discs. The avowed effort here is, for the first time in a single collection, to offer a sampling of Ennio Morriconeâ€™s work in every one of the specialized fields of musical composition in which he has worked. The set is organized accordingly: Music for Cinema (9 discs); Music for Television (2 discs); and one disc each covering Contemporary Classical Music, Orchestral Arrangements, Hit Song Arrangements, and Original Songs. If you bought GDMâ€™s previous extravaganza, Ennio Morricone: The Super Gold Edition (GDM Music srl, 0168292GDM; 6 discs, avail. at $45-85), you may well wonder whether the cinema music portion of this new collection replaces that previous set. No, it doesnâ€™t. While the vast majority of the cuts on the previous set are also included in the present one, there are several instances in which a film represented in the earlier box set is represented this time by a different excerpt, or none at all. So if you buy the new box, thereâ€™s reason to hang on to the earlier one as well. Like the earlier box, this new setâ€™s CDs are all in matching format, featuring the same superb pencil portrait of Morricone at mid-age; unlike the earlier box, the new one has color-coded the CDs, so one can always grab the right sleeve to consult the contents of the current disc. A big difference between the new set and the old one is that the works on the new set are presented in chronological order, enabling you to trace the evolution of the Morricone touch from the late â€™50s right through to last year, spotting patterns, repetitions, variations, and increasingly complex and inventive stylistic gestures. The Orchestral and Hit Song Arrangements discs remind us that Morricone began his career as an arranger, and offer several gems from his early work. The Orchestral Arrangements include versions of such diverse familiar tunes as â€œQuando Quando Quando,â€ â€œYou Go to My Head,â€ â€œGreensleeves,â€ â€œThe Pink Panther,â€ â€œExodus,â€ and â€œCiribiribin.â€ The â€œHit Songsâ€ are all Italian, from the European pop charts of the late â€™50s and early â€™60s, all unknown in the U.S. and featuring the voices of long forgotten singers, with one significant exception: “Ogni volta,” an early Italian chart success sung by Paul Anka. 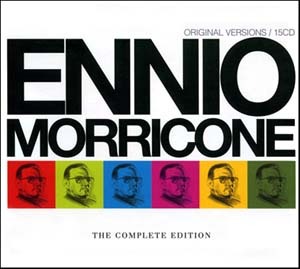 But a critical omission from the song arrangements collection is the absence of any of Morriconeâ€™s settings of western songsâ€”most notably, his arrangement of Woody Guthrieâ€™s iconic â€œPastures of Plenty,â€ sung by Peter Tevis, which was a hit for RCA Italy, led to Morriconeâ€™s being hired by Sergio Leone to compose film music, and offers eyebrow-raising insights into the origin of the Morricone western sound, as inaugurated in A Fistful of Dollars. This recording should have been considered essential to an undertaking of the scope and ambition of this box. The classical music disc will surprise those familiar only with the Maestroâ€™s film music. The music, scored for small ensembles, is largely experimental, frequently atonal, rarely offering any hint of the luxuriant melody-making that characterizes his cinematic work. It does display a kinship with the less tuneful, more arrhythmic and percussive composition that marks Morriconeâ€™s scoring of action and suspense sequences. Though interesting in its own right, this one disc of contemporary classical music is likely to be the least often played. To my surprise, the most often played disc, for me, has been the disc entitled â€œOriginal Songs.â€ It features 18 songs composed by Morriconeâ€”most, but not all, from his film scoresâ€”and includes performances by several great European singers little known in the U.S. The familiar and often-recorded “Se Telefonando” is presented here in its 1966 European chart-topping recording by the wonderful Mina. Also included are knockout versions of â€œRun Man Run,â€ the main title song from La Resa dei conti (The Big Gundown) belted out by Christy (though her Italian version found on the soundtrack CD is even better than the English); “In Fondo ai miei occhi” sung by Anna Moffo; Morriconeâ€™s legendary musical setting of the main title credits to Pasoliniâ€™s Uccelacci e Uccellini sung by Dominico Modugno (of â€œVolareâ€ fame); a sung version of the main theme to La Califfa featuring the voice of Milva; Lisa Gastoniâ€™s performance of the rarely-heard sung version of “Chi mai” from Maddalena; Andrea Boccelliâ€™s operatic rendition of the main theme from the miniseries Nostromo; and a vocal version of the haunting â€œSaharan Dreamâ€ from the television series Secret of the Sahara, sung by Amii Stewart. In fact, about the only thing on this disc I could live without is Joan Baezâ€™s embarrassingly dated lyricization of the main theme from Sacco e Vanzetti. Unaccountably missing from the Original Songs disc are the timeless and beautiful “Al Messico chi vorrei,” written for but not used in Tepepa; and the voice of the legendary Edda dellâ€™Orso, though her estimable wordless vocals are abundantly present throughout the Cinema discs. My one negative reaction to the generally terrific cinema portion of the new box is that so many of what I would consider (and I think I am not alone) to be essential Morricone film compositions are not represented. Including 10 instead of 9 cinema discs would have enabled GDM to rectify all of the most grievous omissions, and acknowledge a few other scores that, while perhaps not as crucial, deserved inclusion: Il grande silenzio; Faccia a faccia; Guns for San Sebastian; Holocaust 2000 (The Chosen); Exorcist II: The Heretic; Le pistole non discutono; Days of Heaven; Tre colonne in cronaca; Mission to Mars; Sette pistole per i MacGregors; Dimenticare Palermo; Five Man Army; I Crudeli. Most of the short-shrifted films are westerns, and one wonders why, since that is where Morricone enjoyed his first success and made his most lasting mark. Moreover, several of the films represented on the cinema discs are also represented on the Original Songs disc, giving them two shots (sometimes two different recordings of the same piece), while other films go unrepresented. And one film that should have been given two shots was not: The Main Title from The Good, the Bad and the Ugly is on the disc, but the quintessential Morricone composition (and Edda dellâ€™Orso performance), “Lâ€™estasia dellâ€™oro” (â€œEcstasy of Goldâ€), is inexcusably absent. An epochal release like this was a golden invitation to create a matching booklet with information on Morricone, his career, and each individual recording in the collection. Instead, GDM opted for a skimpy booklet containing one nice introductory paragraph from the Maestro himself, one nice portrait photo, two middling shots of him at work, a brief summary of his awards, a list of the 14 recordings in the set that are newly mixed, and nine pages of film posters and album covers unaccompanied by any informational or critical text whatever. Despite a few key missed opportunities, however, Ennio Morricone: The Complete Edition is a must for the diehard EM fanatic, and an excellent introduction for the curious and the distant admirer.